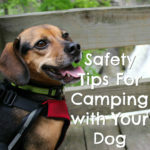 Pet Friendly Road Trip: Denver to LA Why Should My Pet Wear ID Tags? One of my absolute favorite ways to show my love for my dogs is treating them to a special treat. As the weather starts to warm up, frozen treats are always a hit in my house for the pups and people. 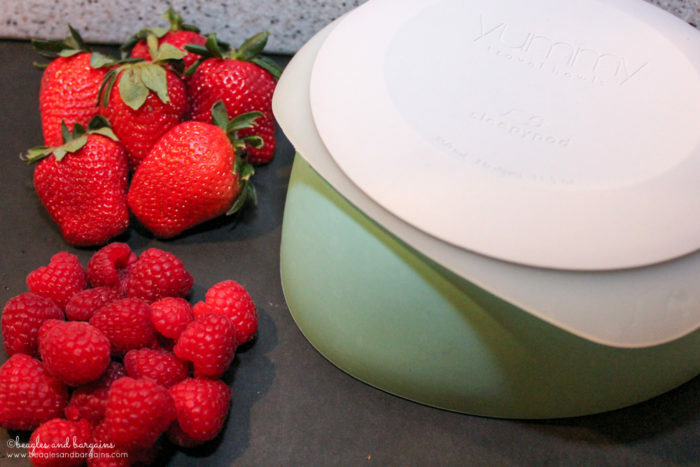 Sometimes I don’t have the patience for individually molded frozen treats or even the freezer space to keep them, so I’ve started utilizing our Yummy Travel Bowls from Sleepypod to freeze up a big batch of deliciousness. Last year we created a Watermelon Cucumber Mint Refresher and this year we’re adding to our recipe list with a yummy Red Berry Spritzer. My favorite thing about BOTH of these recipes is that you can use the same ingredients to whip up one for you too – frozen or just cold! I just might not recommend sharing the actual frozen treat with your pups though, unless you really like a little slobber in your drinks. This post is sponsored by Sleepypod. I am being compensated to help share information about Sleepypod, but Beagles & Bargains only shares information we feel is relevant to our readers. When I was thinking about what we might try in our next frozen treat, my mind immediately jumped to red berries – raspberries and strawberries. Both of these tasty fruits are good for dogs when eaten in moderation. Raspberries are low in sugar and have tons of vitamin C and fiber. They also have anti-inflammatory properties, which may be great for alleviating pain and pressure from joints in senior dogs. However, they do have very tiny amounts of the natural sweetener xylitol, which can be harmful to both dogs and cats. For that reason, we limit the amount of raspberries to less than a cup at a time. Strawberries are actually very high in sugar, so we want to limit them as well. Though they are sugary, they are full of fiber and vitamin C. Plus, I haven’t met a dog yet who didn’t like them! 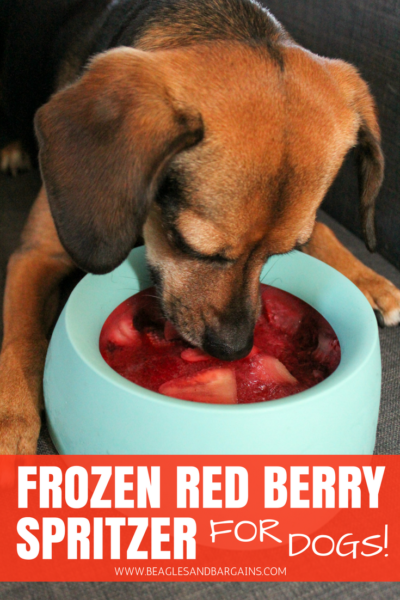 As always moderation is key, but it’s more than okay to treat your dog (or even yourself) to a special frozen treat with red berries on occasion. 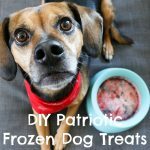 I love using simple frozen treats like this as ways to entice my dogs to stay hydrated when it’s hot and dry out. If you don’t have the time to freeze it, just mix it up and serve. 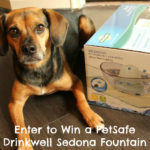 Think of it as fruit infused water for your dog! Or you could even freeze partially and serve it slushy. 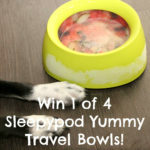 I personally love making these frozen treats in my Yummy Travel Bowls from Sleepypod. Not only are these bowls brightly colored and super cute, but they are designed to be spill proof and freezable. 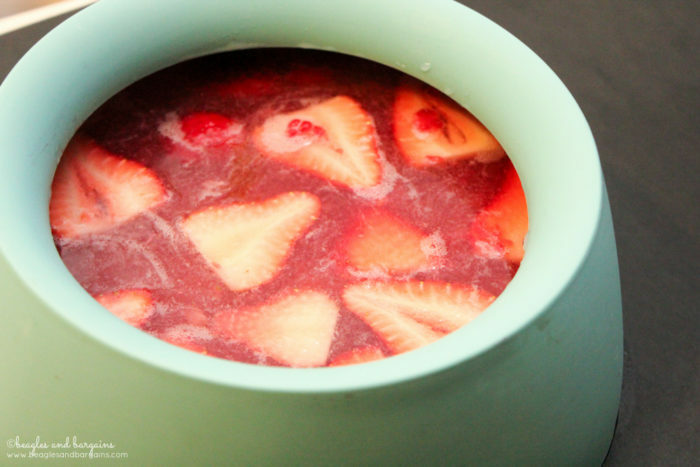 We always freeze some water before a long road trip or hike, so why not add some fruit to it? 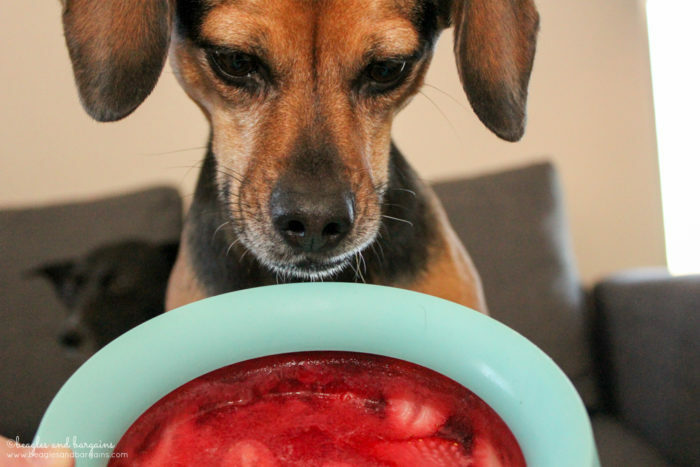 And the bowl doesn’t tip whether you’re in the car or your dog just really really wants to get to the delicious concoction inside. Plus? It’s dishwasher safe, so clean up is SUPER easy. Smash 1/2 of raspberries and strawberries with a muddler or fork. 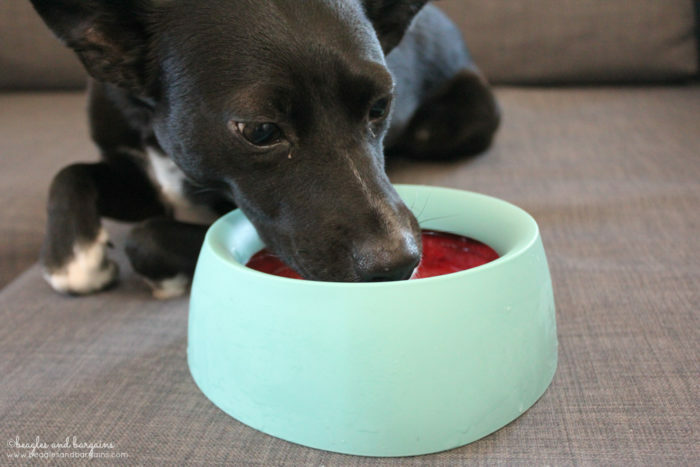 Add strawberries and raspberries to your Sleepypod Yummy Travel Bowl (or similar). Add fresh water until bowl is full. Don't overfill. Seal and freeze overnight or for 8-10 hours. Traditionally, a spritzer is made with sparkling water and wine. For the dogs, we leave those out. But for yourself, feel free to spice things up! 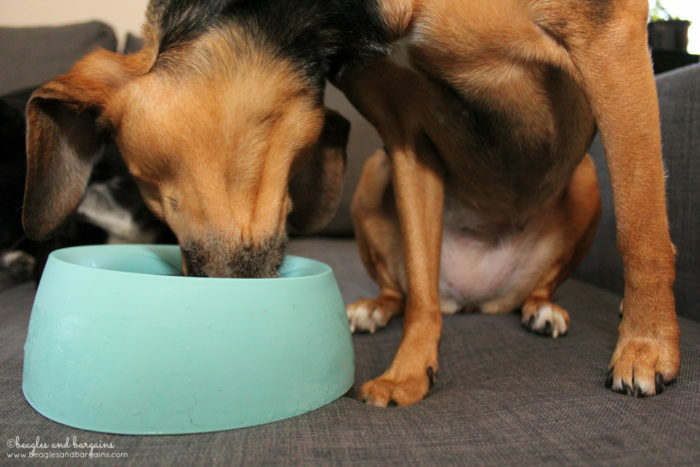 If your dog is anything like Luna, they’ll love it enough to eat it… upside down? Let’s not ask! If you have a food hound like me, then keep an eye on them because they might just try to gobble up the whole thing in one go. You might need to put it back in the fridge or freezer after a few minutes. If your dog does manage to drink it all, then just plan an extra bathroom tip into your day. 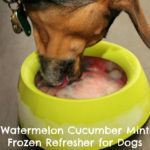 Don’t forget to try out our Watermelon Cucumber Mint Refresher and our Patriotic Frozen Dog Treats too! Like this post? 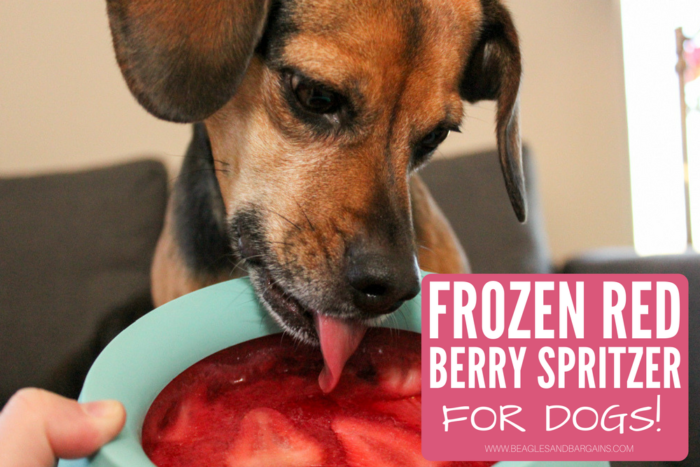 Share this recipe for Frozen Red Berry Spritzer for Dogs by pinning the image below on Pinterest!